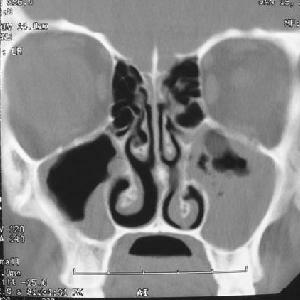 A 14-year-old boy presents with recurrent nasal congestion and left suborbital pain of 2 weeks duration. 1 week prior to the onset of these symptoms, he described having a "cold." On physical exam, there is pain over the left maxillary sinus. A CT of the head is shown. Other risks include systemic disease, anatomic anomalies, mucociliary dusfunciton, trauma, noxious chemicals such as pollutants or smoke, medications. Suspect with fever, localization symptoms such as orbital swelling, changes in vision or significant facial pain or numbness, nasal bleeding. Endoscopy may show mucosal necrosis (indicative of mucormycosis). Mucormycosis grows rapidly and can invade vasculature causing ischemia. Diagnosed with biopsy/histology. CT can be obtained to evaluate extent of disease. Treatment in general is unclear. Some studies suggest improvement with antibiotics (such as macrolides) and topical or oral steroids. (M2.ET.4798) An 8-year-old female presents to her pediatrician with nasal congestion. Her mother reports that the patient has had nasal congestion and nighttime cough for almost two weeks. The patient’s 3-year-old brother had similar symptoms that began around the same time and have since resolved. The patient initially seemed to be improving, but four days ago she began developing worsening nasal discharge and fever to 102.6°F (39.2°C) at home. Her mother denies any change in appetite. The patient denies sore throat, ear pain, and headache. She is otherwise healthy. In the office, her temperature is 102.2°F (39.0°C), blood pressure is 96/71 mmHg, pulse is 128/min, and respirations are 18/min. On physical exam, the nasal turbinates are edematous and erythematous. She has a dry cough. Purulent mucous can be visualized dripping from the posterior nasopharynx. Her maxillary sinuses are tender to palpation. (M2.ET.4798) A 5-year-old male presents to the pediatrician with a 10-day history of cough that is worse at night. The patient has a history of mild intermittent asthma and has been using his albuterol inhaler without relief. He has also been complaining of headache and sore throat, and his mother has noticed worsening rhinorrhea. The patient’s past medical history is otherwise unremarkable, and he has no known drug allergies. In the office, his temperature is 101.8°F (38.8°C), blood pressure is 88/65 mmHg, pulse is 132/min, and respirations are 16/min. The patient has purulent mucus draining from the nares, and his face is tender to palpation over the maxillary sinuses. His pharynx is erythematous with symmetric swelling of the tonsils. On lung exam, he has moderate bilateral expiratory wheezing. 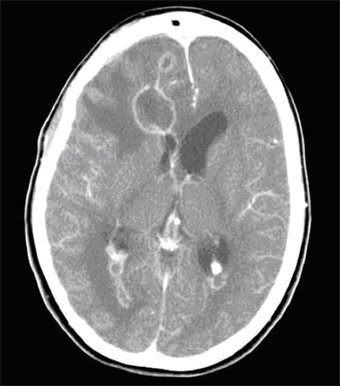 (M2.ET.4798) A 54-year-old male presents to the emergency department with nasal congestion and sore throat. He also endorses ten days of fatigue, rhinorrhea and cough, which he reports are getting worse. For the last four days, he has also had facial pain and thicker nasal drainage. The patient’s past medical history includes obesity, type II diabetes mellitus, and mild intermittent asthma. His home medications include metformin and an albuterol inhaler as needed. The patient has a 40 pack-year smoking history and drinks 6-12 beers per week. His temperature is 102.8°F (39.3°C), blood pressure is 145/96 mmHg, pulse is 105/min, and respirations are 16/min. On physical exam, he has poor dentition. Purulent mucus is draining from his nares, and his oropharynx is erythematous. His maxillary sinuses are tender to palpation.